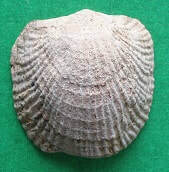 Fascinating facts about Brachiopods: * They are often referred to as "living fossils"
because they have remained unchanged for millions of years. 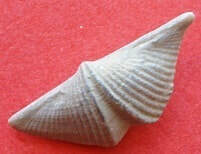 * Most brachiopods attach themselves to the ocean floor with a stalk-like structure called a pedicle. ~ 3" x 3.5" in length. Near museum quality. ~ 2.0" to 2.5" in length. 1 or both tips may be broken. Parispirifer bownockeri, sp ~ 2" across. Neospirifer triplidatus, sp. ~ 1.25" across.